If, heaven forbid, your dog were to be seriously injured, have a fit or stop breathing, how would you react? In emotional and distressing situations, we can surprise ourselves by how we respond. Either we keep calm, which allows us to comfort our animals and assist those attending to them, or we make things worse by freezing or panicking, distressing our pet further and hindering veterinary help. It is important to remember that, as the owner, you are a valuable source of information for any first aider or vet. After all, no one has better knowledge of what’s normal for your pet and what isn't, so this will enable you to seek the right help quickly. Unfortunately we can’t know or predict when an emergency situation is going to unfold. But that doesn’t mean we can’t be prepared. Your vet’s address and the best route there. The number of an out of hours/emergency vet. Contact information of the nearest vet if you’re away from home. In an emergency, there are two key goals: to prevent further harm to the animal, and avoid harm to yourself or others helping the animal. Calling for help - your vet should always be your first port of call. Checking for danger - if you’re in a busy area or at the roadside, for example, you could be putting yourself and your pet in more danger by staying put. Find somewhere out of harm’s way, where you can assist your pet from a position of safety. Controlling the dog - try to put a lead on when possible. A slip lead is easiest. Checking vital signs - including respiration, pulse, temperature, and mucus membranes. If you’re aware of what’s normal for your pet in terms of breathing, pulse and gum colour, you can check these vital signs in an emergency. It would be worth taking them multiple times and then taking an average. 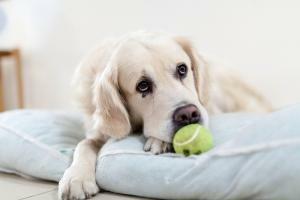 When your dog is resting, they will take an average of 15-30 breaths per minute. This will depend on their breed, size and age and may be affected by factors such as temperature and whether they are sleeping or exercising. You can check your dog is breathing by chest movement or by placing a hand or a tissue in front of the nose. When your pet is in a relaxed state, count the number of breaths they take in one minute. You can feel for your dog’s pulse behind the left elbow or inside the hind leg. Use a finger and don’t apply too much pressure. Count for 10 seconds and multiply by 6, or for 15 seconds and multiply by 4. This will give you an average bpm for your dog. For young dogs, the average bpm is 110-120, while for small adult dogs it is 80-120 bpm. For larger adult dogs, the range is typically 60-80 bpm. The gums should be healthy pink in colour, not pale, white or blue. Colour should return to them in 1-2 seconds after pressing down on them. If the refill time is longer, it may indicate a problem. We hope this has been helpful, but if you have any questions or words of advice for your fellow readers, please comment below! Very good advice.As a first time dog owner I am still learning!